As the Marquette community takes a deep dive this year on the drive to achieve health equity — through Marquette Forum events such as last week’s lectures by Dr. David R. Williams of Harvard University — Marquette’s faculty members are also tackling health disparities and social determinants of health through their community-engaged research and engagement. Since the latest issues of Marquette Magazine and Discover, Marquette’s magazine of research, scholarship and innovation, feature these faculty-led projects and partnerships, we’ve brought this coverage together for you in a convenient round-up. Read it here. 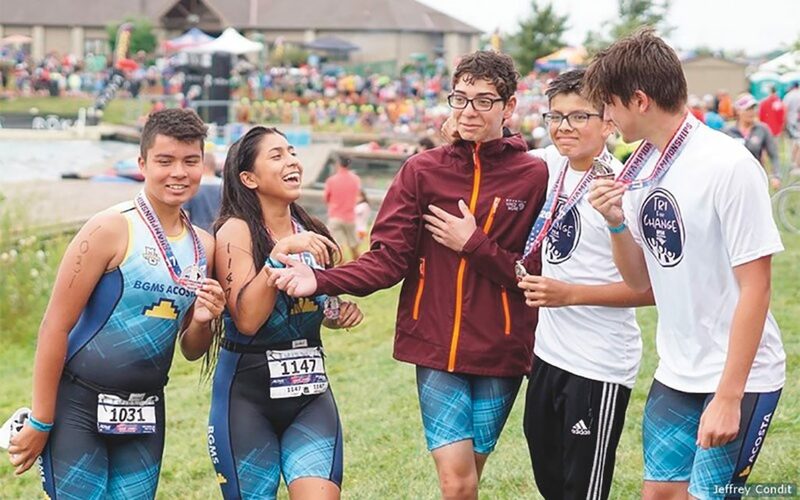 Middle school students from the YES Program compete in a competitive triathlon. Marquette Momentum is a regular series of stories that highlight progress at Marquette as the university implements its strategic plan, Beyond Boundaries. Have a story for Marquette Momentum? Submit your idea online and put “Marquette Momentum” in the description. Marquette Momentum is a regular series of stories that highlight progress at Marquette as the university implements its strategic plan, Beyond Boundaries.